File Photo - Fighters of Syrian Democratic Forces walk through rubble, on the way to their positions as they battle Islamic State militants at the frontline in Raqqa, Syria October 7, 2017. RAQQA, Syria - A final assault on Islamic State’s last line of defense in its former Syrian capital Raqqa should begin on Sunday night, a field commander for the U.S.-backed forces operating there said. The loss of Islamic State’s remaining streets and buildings in Raqqa following its defeat in Iraq’s Mosul this year and its retreat from swathes of territory in both countries, would mark a major milestone in the battle to destroy the jihadist group. The assault on militants in the center of the northern city will focus on surrounding the sports stadium there, said a field commander in the Syrian Democratic Forces (SDF) in western Raqqa, who gave his name as Ardal Raqqa. Islamic State declared a caliphate in 2014 and at the height of its power ruled over millions of people, from northern Syria to the outskirts of Iraq’s capital Baghdad, but it has since endured a series of losses under attack from many sides. Raqqa was the group’s de facto Syrian capital, a center of operations where it oversaw the management of much of eastern, central and northern Syria and planned attacks abroad. Now it is hemmed into a small area in the city center that includes the stadium, the National Hospital and a roundabout where Islamic State once displayed the heads of its enemies. In the hours before the expected launch of the final assault, which the commander said could take up to a week, the sound of gunfire sporadically rattled around the area near the hospital. The district had been flattened, with buildings completely gone. Coalition jets soared overhead and air strikes pounded at a higher rate than in recent days. Islamic State has lost most of its territory to the SDF, spearheaded by the Kurdish YPG militia, and to a rival offensive by Syria’s army and allied forces this year, and has fallen back on the fertile Euphrates valley area downstream of Raqqa. The army and its allies reached the city of Deir al-Zor in September after a months-long offensive across the Syrian desert, and have since then pushed down the Euphrates towards the border with Iraq. On Sunday a Syrian military source said they had encircled Islamic State fighters in the city of al-Mayadin, one of the jihadists’ last strongholds in the area. “Units of our armed forces with the allied forces continue their advance on a number of fronts and axes in Deir al-Zor and its countryside... and encircle Daesh terrorists in the city of al-Mayadin,” the military source said. However, the group has still been able to launch a series of effective counter attacks against the Syrian army in the central desert region over the past week, putting pressure on the main supply road to Deir al-Zor from the west. Syrian President Bashar al-Assad is backed in the war by Russia, Iran and Shi‘ite militias including Lebanon’s Hezbollah, and its campaign against Islamic State has mostly been on the west bank of the river. The U.S.-backed SDF campaign has mostly been on the east bank, where Raqqa is located, and has also advanced downstream to hold areas opposite Deir al-Zor. The United States and Russia have put in place channels to lessen the risk of fighting between the rival offensives they back. U.S. officials have previously said that Islamic State had relocated some of its diminished command and propaganda structures to al-Mayadin as it was forced from territory elsewhere. The spokeswoman for the SDF campaign in Raqqa, Jihan Sheikh Ahmad, said in a statement on a website for the campaign that it would announce the liberation of Raqqa “in the coming few days” after having captured 85 percent of the city. Commanders directing the battle in Raqqa have said that Islamic State fighters have taken civilian hostages and are using sniper fire, booby traps and tunnels to slow the SDF advance. 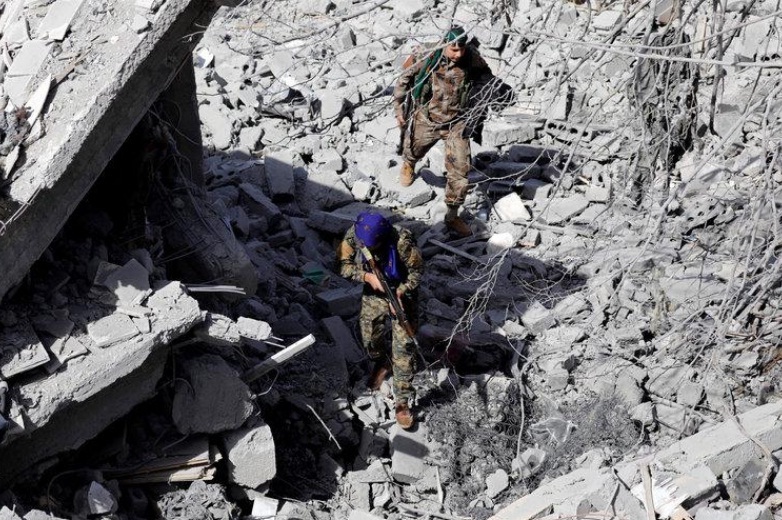 The SDF began its campaign to isolate Raqqa early this year, pushing along several fronts to enclose the city against the Euphrates backed by coalition air strikes and special forces. A final assault on Islamic State’s last line of defense in its former Syrian capital Raqqa should begin on Sunday night, a field commander for the U.S.-backed forces operating there said.